John MacArthur is known worldwide for his teaching ministry and best-selling writing. For more than four decades, his work has been characterized by one important, unwavering emphasis: careful, verse-by-verse exposition of the Bible. Truth Endures commemorates that lifelong focus by bringing together twelve of MacArthur's classic sermons, including "The Simple Gospel," "The Purpose of Trials," "Jesus' Death Shows Us How to Live," and "Making Hard Decisions." MacArthur's veteran years of ministry experience shine through in each Bible-centered sermon. Forty years in the making, Truth Endures is a landmark volume that will be prized by MacArthur readers everywhere. Endorsements"For the thirty years I've studied under John MacArthur's preaching, he has always taken great pains to give the historical and scriptural context behind each verse, reminding the believer that every noun and verb in the Bible is inspired by the Holy Spirit to call us to a holy and obedient life. It's what makes John's sermons so timeless and enduring. And I'm excited that this collection in Truth Endures includes some of his best work!" "John MacArthur clearly has a love affair with sacred Scripture. He understands that what the Bible says, God says. He submits his mind and his will to the truth of the Bible. Not concerned with echoing clichfds on biblical texts, John digs deeply - deep into the original languages - deep into the text itself - and then expounds with clarity and courage what he finds in the text. He has no interest in novelty or self-aggrandizement. His passion is fidelity. . . fidelity to Christ. . . fidelity to the Word of God." 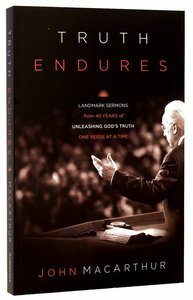 About "Truth Endures: Landmark Sermons From Forty Years of Unleashing God's Truth One Verse At a Time"
John MacArthur, the author of numerous best selling books that have touched millions of lives, is pastor-teacher of Grace Community Church in Sun Valley, California and president of The Master's College and Seminary. He is also president of Grace to You, the ministry that produces the international radio program Grace to You and a host of print, audio, and Internet resources. He authored the notes in the Gold Medallion Award-winning The MacArthur Study Bible. John and his wife, Patricia, have four children who have given them thirteen grandchildren.- Publisher.